MSJC student Wayne Yeager of Hemet poses with his winning entry in the Unity Breakfast art contest. Residents, students and officials gathered at Mt. San Jacinto College Monday to honor the work of Dr. Martin Luther King Jr. with the theme of social justice and equity at the 12th annual Unity Breakfast. Congressman Raul Ruiz, D-La Quinta, said there is no room in society for the insults and extremism heard too often today. He reminded the audience that King was a visionary who dreamed of a peaceful and just world. He urged the audience to "Keep calm and love on," a theme he said his own pastor spoke about recently in church. "I think that’s the remedy (against hate) we should have now, to keep calm and love on," Ruiz said. The annual Unity Breakfast at MSJC is designed to bring the community together and remember the message and work of King to promote social justice and equity. Guests enjoyed breakfast, performances, speaker presentations, and a student art contest. MSJC Political Science Professor Willie Hamilton coordinated and hosted this event with the MSJC Diversity Committee. 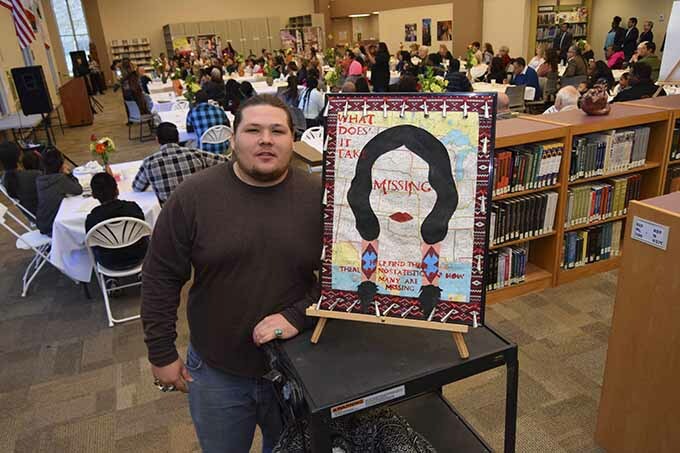 MSJC student Wayne Yeager, 20, of Hemet won first place in the MLK Day Unity Breakfast art contest for his art that raises awareness of missing Native American women. He said across the U.S., Native women are raped and murdered or otherwise go missing without much help in finding them or solving the problem. He hopes law enforcement and other officials put emphasis on solving these crimes and finding the women. "There are no stats or databases to show how many of these women are missing," Yeager said. "It’s disheartening." MSJC student Mya Correa won second place and student Karen Day earned third place in the student art contest. Dr. Raquell Rall gave a talk titled "Maximizing Educational Outcomes For Communities That Traditionally Have Had The Least Opportunities." Members of the Mt. San Jacinto College Diversity Committee thanked the MSJC Board of Trustees and President/Superintendent Roger Schultz for their continued support and participation. Members in the audience included MSJC Board President Bill Zimmerman; MSJC Trustees Tom Ashley, Dorothy McGargill and Ann Motte; former Trustee Eugene Kadow; San Jacinto Councilman Andrew Kotyuk, and many others. 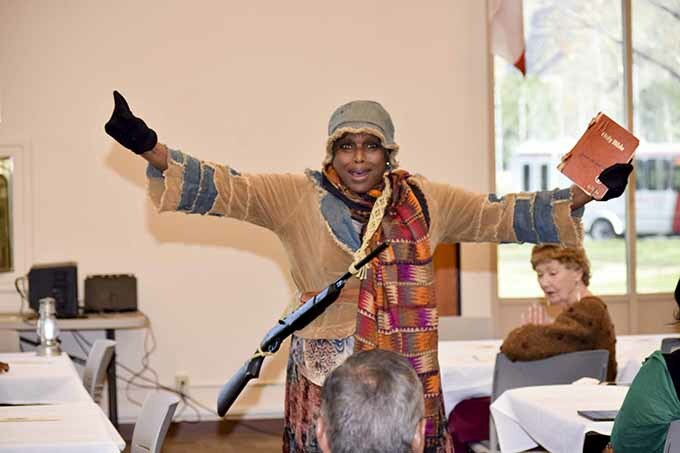 Toni Malone performs as Harriet Tubman, an American abolitionist, humanitarian and scout for the U.S. Army during the Civil War.